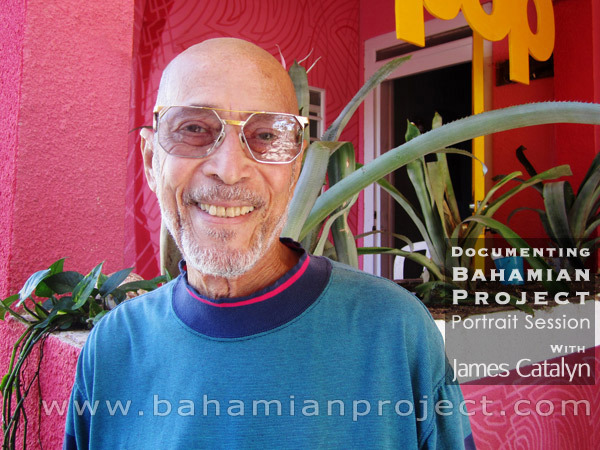 This picture of James Catalyn was taken right after his portrait session for the Bahamian Project. The final portrait images will be unveiled at the Exhibition Opening at the National Art Gallery of The Bahamas on July 11, 2013. However, many of his plays carry a more serious message, sometimes even biting. James Catalyn is a satirist who delivers strong social commentary sugar-coated in humour. He has accepted a self-imposed responsibility to hold up a mirror of our society and then literally brings us to laugh at ourselves. By doing so, he says he hopes to make people aware of things they may not have noticed about themselves, about their communities, about their country. He hopes such enlightenment can possibly help to correct some of the wrongs. It is entertainment but it is also an inspection of who we are. His plays have become a kind of plumb line for society. He coined the phrase “laughing at we sef”. “We have to learn how to laugh at ourselves. Other people are laughing at us so if we laugh at ourselves, it will make life easier,” he said. None of our secrets are sacred to James Catalyn. He points out all of our hypocrisies, our follies, and even addresses very difficult, sensitive issues, like drugs, youth pregnancies, and AIDS. “We speak of the social ills in the country through a collection of skits similar to Saturday Night Live,” he said of himself and his troupe known as James Catalyn and Friends. Indeed, he leans forward, laughing with wicked delight. “If you have never lived on the ground, you can not write from the ground,” he said. It is a profound statement. James Catalyn writes from the ground and his plays not only keep us grounded… they keep us laughing at we sef.